﻿ أكبر عريضة عالمية وقعها 15000 خبير تحث على وقف نمط حياتنا الاستهلاكي والحد من الزيادة السكانية أو الحضارة ستنتهي بحلول عام '00 2040 !! وقع 15000 من أفضل الخبراء العالميين عريضة لوقف الإفراط في إضاعة الموارد الطبيعية والحد من النمو السكاني. إذا لم نفعل ذلك ، فستموت الحضارة في 22 سنة أي بحلول عام 2040 !! 15,000 of the world's best experts signed a petition to teach us to stop wasting natural resources and urge to reduce population growth. If we do not, civilization will die in 22 years that is by the year 2040 !! Twenty-five years ago, the Union of Concerned Scientists and more than 1700 independent scientists, including the majority of living Nobel laureates in the sciences, penned the 1992 “World Scientists’ Warning to Humanity” (see supplemental file S1). These concerned professionals called on humankind to curtail environmental destruction and cautioned that “a great change in our stewardship of the Earth and the life on it is required, if vast human misery is to be avoided.” In their manifesto, they showed that humans were on a collision course with the natural world. They expressed concern about current, impending, or potential damage on planet Earth involving ozone depletion, freshwater availability, marine life depletion, ocean dead zones, forest loss, biodiversity destruction, climate change, and continued human population growth. They proclaimed that fundamental changes were urgently needed to avoid the consequences our present course would bring.The authors of the 1992 declaration feared that humanity was pushing Earth's ecosystems beyond their capacities to support the web of life. They described how we are fast approaching many of the limits of what the ­biosphere can tolerate ­without ­substantial and irreversible harm. The scientists pleaded that we stabilize the human population, describing how our large numbers—swelled by another 2 billion people since 1992, a 35 percent increase—exert stresses on Earth that can overwhelm other efforts to realize a sustainable future (Crist et al. 2017). They implored that we cut greenhouse gas (GHG) emissions and phase out fossil fuels, reduce deforestation, and reverse the trend of collapsing biodiversity.On the twenty-fifth anniversary of their call, we look back at their warning and evaluate the human response by exploring available time-series data. 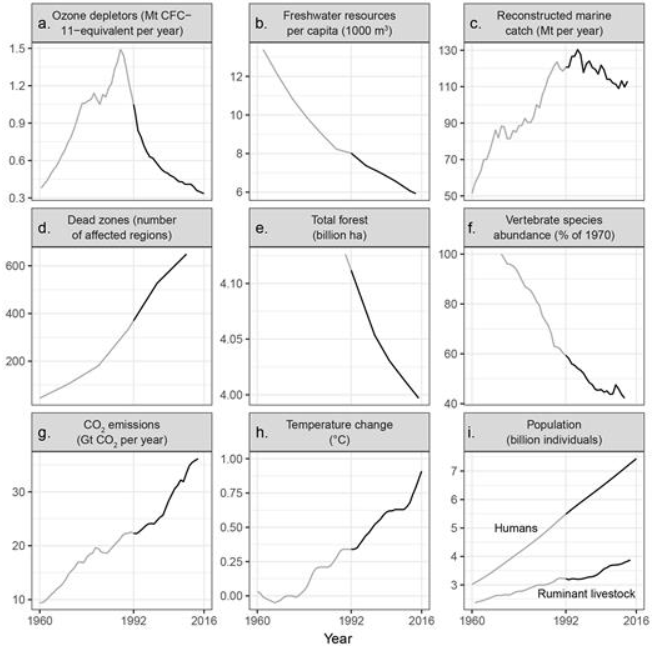 Since 1992, with the exception of stabilizing the stratospheric ozone layer, humanity has failed to make sufficient progress in generally solving these foreseen environmental challenges, and alarmingly, most of them are getting far worse (figure 1, file S1). Especially troubling is the current trajectory of potentially catastrophic climate change due to rising GHGs from burning fossil fuels (Hansen et al. 2013), deforestation (Keenan et al. 2015), and agricultural production—particularly from farming ruminants for meat consumption (Ripple et al. 2014). Moreover, we have unleashed a mass extinction event, the sixth in roughly 540 million years, wherein many current life forms could be annihilated or at least committed to extinction by the end of this century.